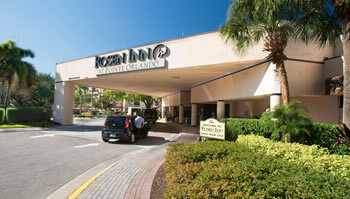 Opening by April 12, a new fitness center will be available for guests staying at Rosen Inn at Pointe Orlando. Located next to Pool #2, guests will be able to unlock the fitness center and its attached restrooms with just a room key. Access to the gym is complimentary for our guests and unlimited between the hours of 6 a.m. and 11 p.m. Afterward, doors lock automatically. The fitness center is equipped with two treadmills each with a private TV, an elliptical machine also with a private TV, one spin bike, free weights, and a pull-down gym machine. Playtime for the kids during vacation is important and the reason why we have a playground onsite just for the little ones! Nestled safely between our buildings and centrally located between pools #1 and #2, the fenced-in playground features cool structures to climb and slide on. The rubber floor keeps kids relatively safe from hard landings. Right behind the children’s playground is another area dedicated to fun for kids of all ages: the video arcade game room. This cool room has a pinball machine, shooter games, an air hockey table, and classic-style arcade games. The highlight at the video arcade game room is definitely the outdoor billiards table sheltered beneath a covered patio. Seating is available in the patio area so you can enjoy the weather and relax while having some fun playing games. Print your boarding pass, send an email or fax, even ship a box* from the Business Center. Fully equipped computer stations are available, from which you can complete business while you vacation in Orlando. *Please visit the Business Center for details, restrictions, and fees on receiving and shipping boxes, and for use of certain equipment. Shipping allowed with prepaid FedEx or UPS labels.